If you need a work truck with four cylinders, the 2008 Chevrolet Colorado might be a good bet. Aside from the Ford Ranger, there's not much competition at the bottom for this type of truck—mostly because a cheap full-size pickup isn't that much more expensive. It's easy to push a Colorado's price tag into the high $20,000 range, which isn't recommended. Stick with the less plush versions and you'll get the best value for your money. The 2008 Chevrolet Colorado fits the bill as a compact work truck with a smaller appetite for fuel, but its engines are noisy and the rear seats on four-door models are a letdown. TheCarConnection.com's editors read the latest reviews on the new 2008 Chevrolet Colorado to write this comprehensive review. Our car experts also drove the 2008 Chevrolet Colorado to be able to deliver our definitive opinion on the car, to compare it with other cars in the class, and to give you the best advice even when other reviews present conflicting opinions. There are plenty of good reasons to own a compact pickup truck like a 2008 Chevrolet Colorado. For tradesmen needing better fuel economy, there's nothing to substitute for a vehicle with a bed. Still the Chevy Colorado isn't that satisfying a vehicle to drive, and its meager four- and five-cylinder engines, combined with a short pickup bed, limit both its entertainment value and its utility. High gas prices have given the Chevy Colorado a new appeal. Base models are powered by a 2.9-liter four-cylinder engine offering 185 horsepower, while the optional inline five-cylinder engine measures in at 3.9 liters and delivers 242 horsepower. Drivers can see as much as 18/24 mpg with the four-cylinder, and can even manage 15/20 mpg with the five-cylinder engine and automatic transmission. Neither combination is very enjoyable to pilot or to listen to; they're noisy engines that sound unrefined next to the silkier sounds coming from a four-cylinder Toyota Tacoma. A smoother V-6 would be a good option, but none is available. Variety is one of the Colorado's chief draws. It's available in either rear- or four-wheel drive, in short-wheelbase regular-cab and long-wheelbase extended- and four-door crew-cab versions, and can seat up to six passengers in crew-cab mode. The backseat stands uncomfortably upright on four-door versions, though, and there's no option to fold the seats under the floor, which would make the rear area much more useful. The six-foot "long" bed won't carry the 4x8 sheet of plywood, and four-door Colorados have only a 5-foot, 1-inch bed anyway. The 2008 Chevrolet Colorado looks more like a full-size truck than its compact size would indicate—but inside, it's awash in inexpensive plastics and cheap-feeling switches. Three different suspension packages are offered, along with a long list of options that allows for maximum customization. In most versions, the 2008 Chevrolet Colorado has better-than-average ride and handling. Standard equipment includes air conditioning, a tilt steering wheel, cruise control, and folding exterior mirrors. 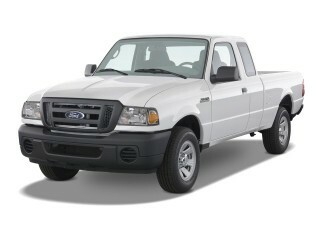 Options include traction control, XM, fog lamps, leather seats, a sunroof, a six-CD changer, and a sliding rear window. OnStar is offered, but there is no navigation system—a real need in work trucks. Front-impact safety performance is good—the four-door Chevrolet Colorado gets five-star crash scores, while other versions get four stars—but side curtain airbags are optional, but the Colorado gets a "poor" rating for side-impact safety from the IIHS. The Chevrolet Colorado has big-truck styling outside, but a more spartan interior than most reviewers like. Kelley Blue Book is relatively impressed with the base 2008 Chevrolet Colorado trim, calling it "an attractive alternative for those whose truck use tends to be recreational." The exterior has a "look that says 'Chevy,' [with] bulging fender flares and bright alloy wheels [that] punctuate tall slab sides." Automedia calls its styling "terrific," and believes it "resembles a scaled-down Silverado with a rugged and sporting stance." Truck Trend notes that the Colorado comes in three different cab styles: "regular cab, extended cab, crew cab (with four full-size front-hinged doors)" and that "regular and extended cabs get a 6-foot-1-inch-long bed and crew cabs feature a 5-foot-1-inch-long bed." Edmunds feels that "The Colorado's aggressive, angular styling makes big promises of power, ruggedness and capability." Cars.com calls it "aerodynamic, angular and athletic." The Colorado's interior draws praise for its layout, but takes hits for its aesthetics. Automedia thinks that "Inside, Colorado looks and feels more like a spacious, well-appointed full-size pickup," and Kelley Blue Book describes the Chevrolet Colorado interior layout as "highly functional, with all the gauges and controls in clear sight and easy reach of the driver." However, they also note an "over-abundance of gray throughout the cab" that only differs "in the pricier trim levels." ConsumerGuide likes "the audio and climate controls [that] are simple to use and are clearly marked" and gauges that "are easy to read," though "some digital readouts wash out in direct sunlight." Edmunds complains "recent upgrades to the Colorado's interior make today's version more hospitable than in previous model years. However, plenty of evidence of cost-cutting remains in the form of hard plastics, inconsistent build quality and a near absence of style." Car and Driver slams its "rental-car interior decor." 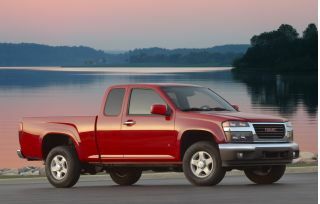 The 2008 Chevrolet Colorado has disappointing power, but many suspension and drivetrain choices make for a decent ride. High gas prices have given the 2008 Chevrolet Colorado a new appeal. Base models are powered by a 2.9-liter four-cylinder engine offering 185 horsepower, while the optional inline five-cylinder engine measures in at 3.9 liters and delivers 242 horsepower. Drivers can see as much as 18/24 mpg with the four-cylinder, and can even manage 15/20 mpg with the five-cylinder engine and automatic transmission. However, neither combination is very enjoyable to pilot or to listen to; they're noisy engines that sound unrefined next to the silkier sounds coming from a four-cylinder Toyota Tacoma. ConsumerGuide remarks the Colorado has only "adequate power for around town driving," while still "lack[ing] reserve for passing or hauling heavy loads." Car and Driver criticizes the four-cylinder as a "thrashy engine." 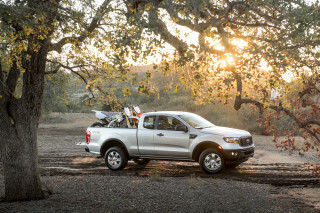 Edmunds points out, "Most of the Colorado's competition, both import and domestic, offer powerful optional V6 engines." Truck Trend counters that, with both engines, "there's a pleasing amount of reserve power left at higher engine speeds for merging onto the Interstate or overtaking another vehicle on a winding two-lane." "You can get a five-speed manual or four-speed automatic transmission with either engine," Edmunds points out, adding, "Like its peers, the Colorado can be equipped with either two-wheel drive or a four-wheel-drive system with a dual-range transfer case." Kelley Blue Book predicts consumers will appreciate the Chevrolet Colorado's "good power and excellent fuel economy...EPA-rated at 24 miles per gallon on the highway." The Colorado comes in a wide range of suspension settings, from base to off-road. Edmunds applauds 2008 Chevrolet Colorado for "affordable, composed handling on- and off-road," and says the "standard suspension is softly tuned for a comfortable ride." Car and Driver remarks the "steering is high-effort" and turns "with a numb feel." MyRide.com thinks the ride is "comfortable and controlled," and says the Colorado has a "light on-road feel, suitable for a light-duty truck" on the Colorado. Kelley Blue Book observes that the "turning radius [that] is uncommonly wide" but find the Colorado's suspension "much more rigid than previous Chevrolet compact pickups," contributing to stability. MyRide takes Chevrolet to task, however, for "brakes [that] require too much pressure before offering an adequate response." Car and Driver concludes by writing, "these trucks trail the competition in every way. 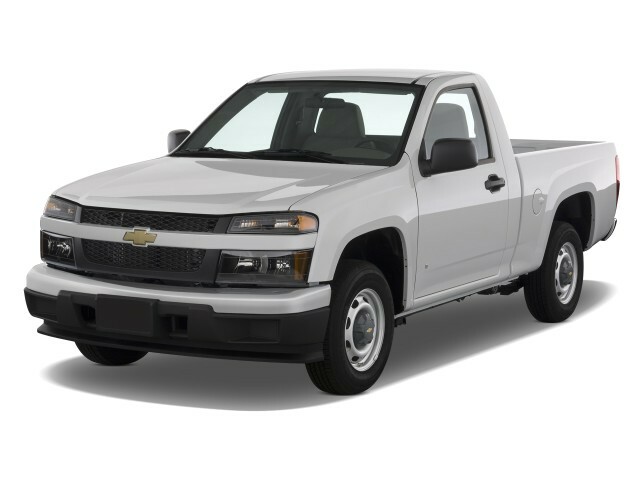 The 2008 Chevrolet Colorado offers a wide variety of body and bed styles, but ultimately, comfort and storage are subpar, as are interior finishes. Variety is one of the Colorado's chief draws. It's available in either rear- or four-wheel drive, in short-wheelbase regular-cab and long-wheelbase extended- and four-door crew-cab versions, and it can seat up to six passengers in crew-cab mode. Comfort, though, is not a strength, and the quality and finish of its cabin leave much to be desired. ConsumerGuide Automotive is generally happy with the front part of the Chevrolet Colorado cab's interior, saying there's "lots of legroom and headroom" and seats are "adequately comfortable for long drives." Kelley Blue Book concurs, declaring the "seats offer firm bottoms and good lumbar support" and that "the cloth fabric is both durable and comfortable." Other reviews, however, were not so positive. Car and Driver writers are overtly critical of the 2008 Chevrolet Colorado interior, citing its "flimsy seats." Edmunds is not impressed with this Chevrolet, either. "Despite improvements over the years," reviewers concede, "seating comfort and cabin materials still leave much to be desired" with the 2008 Colorado. Chevrolet loses marks for giving "the impression of being cheap," with Edmunds noting "subpar materials, an abundance of hard plastic and mediocre seat comfort." The backseat stands uncomfortably upright on four-door Colorados, and there's no option to fold the seats under the floor, which would make the rear area much more useful. Car and Driver notes the "small and uncomfortable back seat," and ConsumerGuide says that "adults lack legroom," though the "Crew Cabs are more spacious" on the Colorado. Chevrolet's rear seats are also faulted for being "hard and undersized." Getting to them is also a challenge, as "entry and exit is difficult through small door openings." Like legroom, "storage is limited," though "better on the Extended and Crew Cab" Chevy Colorado models, attests ConsumerGuide Automotive. As for the truck bed, the six-foot bed won't carry the 4x8 sheet of plywood, and four-door Colorados have only a 5-foot, 1-inch bed. Kelley Blue Book reports that "even over washboard roads, the Colorado exhibited no sign of dash-rattling or squeaks." Edmunds comments that the Colorado remains "relatively quiet around town," with "wind noise around the doors picking up at highway speeds." The 2008 Chevrolet Colorado gets good crash-test scores; side airbags and stability control aren't available at all, though. The 2008 Chevrolet Colorado has some of the most impressive safety ratings in the class, but lacks some important features. The four-door Chevrolet Colorado gets five-star crash scores from the National Highway Traffic Safety Administration (NHTSA), while other versions get four stars. The Insurance Institute for Highway Safety (IIHS) ranks the Colorado as "good" for all front impacts, and "marginal" for side impacts. All versions of the 2008 Chevrolet Colorado offer standard anti-lock brakes, but side curtain airbags are optional and stability control is not offered. Cars.com adds, "side-impact airbags for the front seats are not available." The reviewers at Edmunds find the inclusion of "OnStar emergency communications" that are now standard on all models a welcome addition to the 2008 Chevrolet Colorado. It's easy to configure a Colorado for any duty—work hauling to off-roading—though some sought-after features are not offered. The 2008 Chevrolet Colorado has a good set of standard features, and options include some useful add-ons. Options are bundled or offered as stand-alone items, and they include bucket seats, power windows/locks/mirrors, remote keyless entry, and a self-dimming rearview mirror. Cars.com notes the Colorado's optional "heated leather seating and XM Satellite Radio," as well as the optional "locking differential." Edmunds reviewers like the Chevrolet Colorado's "grille guards, bed extender and 18-inch wheels [that] are also available." Bluetooth and navigation are two options conspicuously missing from the list. There are some truck-specific options not available on the 2008 Chevrolet Colorado that give Car and Driver pause, including "no protective coating or tie-down rails in the bed." My Chevy Colorado has been a great; reliable smallish truck. 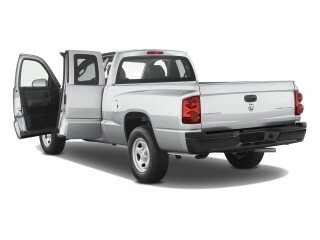 I have the Colorado Z71 crew cab version of the truck. The look inside and out is very good. The power from the 5 cylinder engine is good. It feels strong off the line and has plenty of power and torque to... I have the Colorado Z71 crew cab version of the truck. The look inside and out is very good. The power from the 5 cylinder engine is good. It feels strong off the line and has plenty of power and torque to drive through the mountains with my motorcycle in the back. The handling is pretty good considering the ground clearance of the Z71 package. The on;y negative on that side is going into driveways at does sway side to side a good amount because of the tall sidewall tires. The ride on the road is smooth and pretty comfortable, even without a load in the back. The seats are pretty comfortable. The back seat has plenty of leg room. More than most cars I've been in. The one down side is that the headrests aren't adjustable. The rear headrests block 1/2 of the rearward visibility; making it challenging to back out of spaces with a lot of people walking by. The A/C has worked strong from day one, and is still great. The MP3 CD player works great. The sound quality and speakers are much better than I have had in my older trucks.